Everything you need for your point of sale. Including enterprise grade hardware, no cheap tablets or consumer grade hardware here! All Mynt hardware is enterprise grade and specifically designed for the rigors of daily use in high paced, tough environments. Mynt also includes free shipping, integrated receipt printer and a heavy duty cash drawer. Learn more about Mynt terminals. In addition to complete POS stations, we offer a full spectrum of Mynt add-on peripherals, such as EMV readers, kitchen printers, barcode scanners, handheld ordering stations and more. Mynt comes complete right out of the box. Mynt software was designed with the merchant in mind. Our software is easy to use and full of features to help your business run smoothly. 24/7/365 USA-based technical support that is always there to answer any questions you may have. Mynt believes in their hardware so strongly that they offer a lifetime warranty. If anything goes wrong, they will repair or replace your unit at no cost to you. Perfect for establishments large or small. Every business is unique, which is why Mynt does not believe in the “one size fits all” approach. We offer two distinctly different solutions to fit your needs and budget. 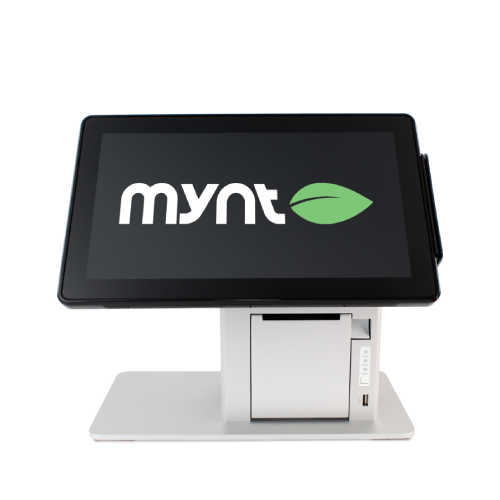 Mynt Pro is perfect for your single location restaurant or retail establishment with 5 or fewer registers. Mynt Enterprise is the most advanced turnkey POS solution for multi-location, franchise QSRs and traditional table service restaurants. Learn More about using Mynt in your business - contact us today!